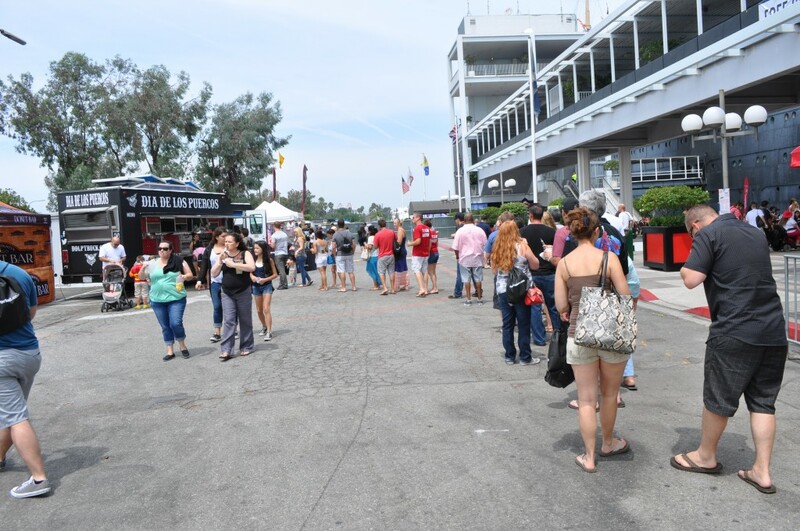 On Saturday, August 2nd the Inaugural Big Bite Bacon Fest ensued at the Queen Mary in Long Beach,CA. Deemed a “Bacon Paradise”, if you did not make it out to this sold out event, oh boy did you miss out on a bunch of savory goodness. 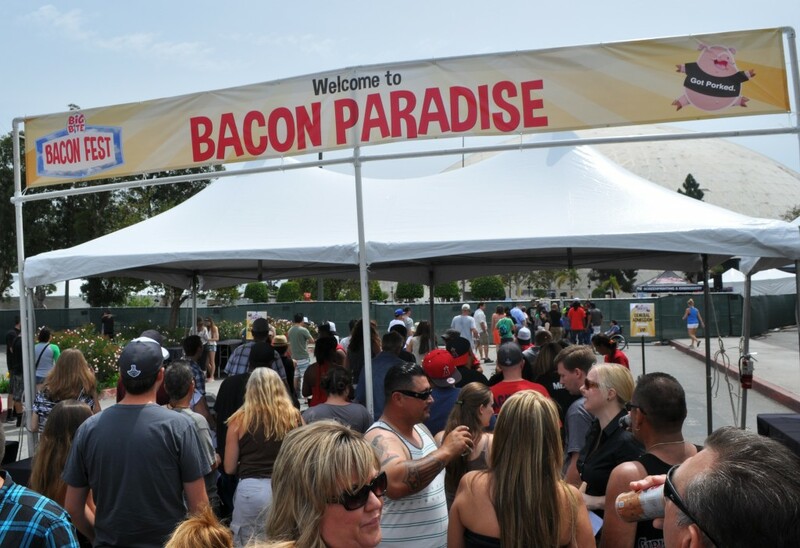 It was a great sunny, hot and humid day as crowds of bacon lovers filled the area surrounding the Queen Mary, dressed in bacon attire and all. 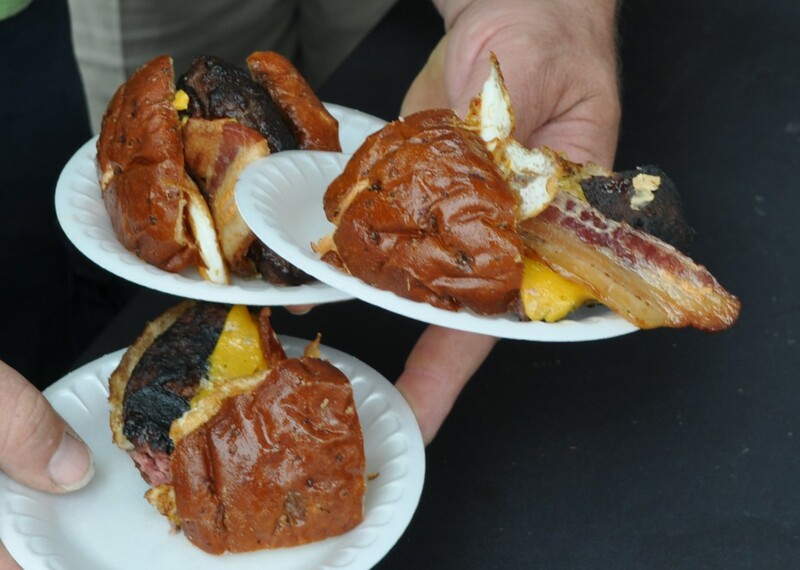 With about 25 various vendors in attendance from BBQ joints and restaurants to bakeries and breweries, a great variety of gourmet and finger-licking good dishes were served up. Though the lines were lengthy, the crowd was lively and excited to indulge in the unlimited savory samples that vendors were serving up. 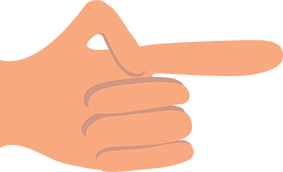 A few crowd favorites proved to be Big Bubba’s Bad BBQ, Donut Bar, Slater’s 50/50, Heavenly Delights and Dia de Los Puercos. 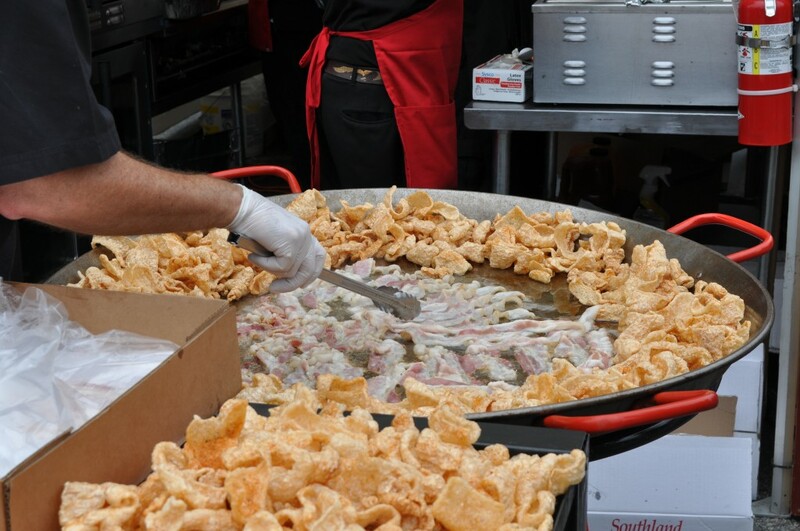 Big Bubba’s Bad BBQ was frying up fresh bacon in a giant paella pan surrounded by pork rinds, which made for great entertainment for those waiting in line. For samples they served the bacon with pork rinds doused in hot sauce, as well as carnitas tacos. 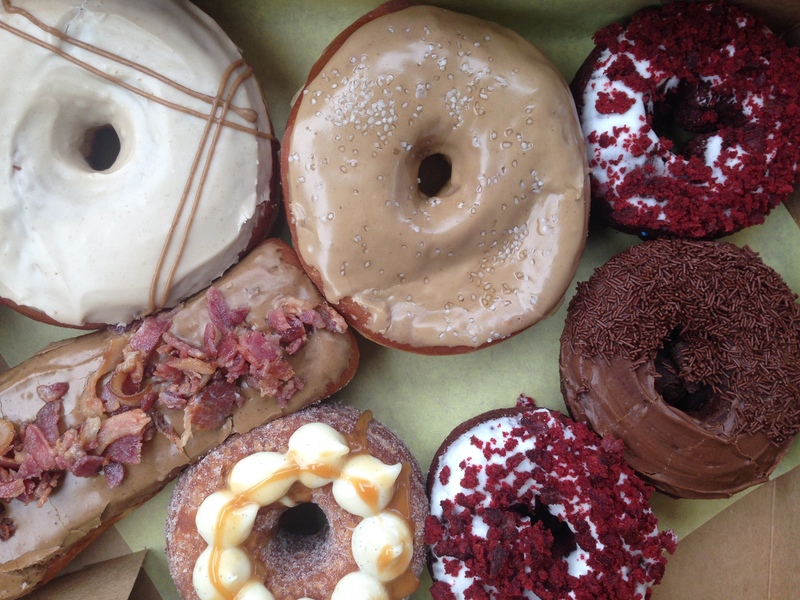 Donut Bar, a native San Diego shop that has recently opened a new store front in the Orange County area, was serving one of their ever so popular Maple Bacon Bar donuts. If you got a chance to stop by their booth they were also giving out $5 coupons, to keep you coming back for more! Slaters 50/50, as seen on Travel Channels Bacon Paradise, was serving samples of their imfamous burgers made of 50% ground bacon and 50% ground beef. 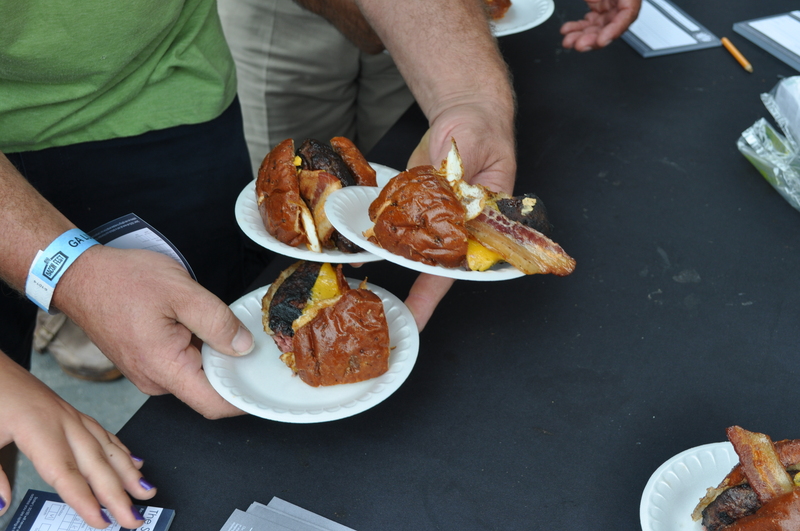 Attendees of the fest were going absolutely crazy over Slater’s, going as far as asking for multiple samples at once, I mean who would really be able to resist a 50/50 bacon cheeseburger? No one, no one. One of the about six dessert vendors, Heavenly Delights, satisfied everyones sweet tooth with the warm peach cobbler they were serving, as they baked them on-site. 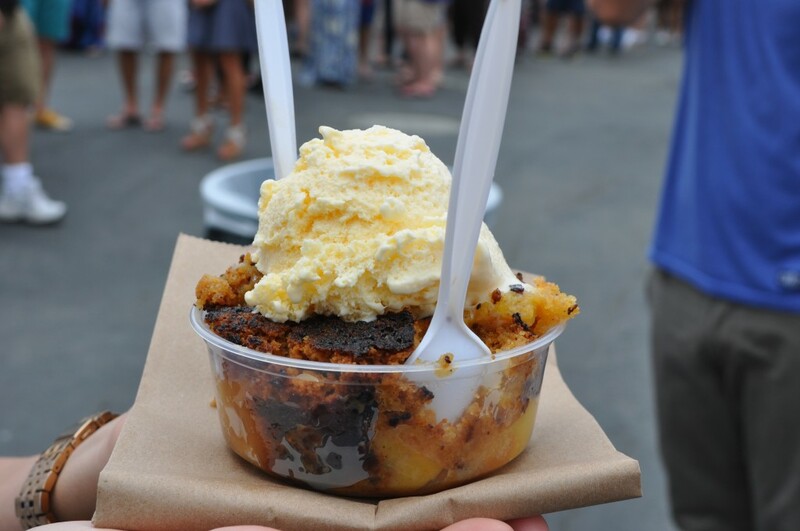 If the sample got your sweet tooth yearning for more, they offered the option to purchase a large portion of cobbler with a bacon crumb crust, all topped with a giant scoop of vanilla ice cream (see the warm delight pictured above). Last, but not least, Dia de los Puercos the only food truck in attendance, proved to be another fan favorite as they cranked out 3 different dishes to serve to attendees. 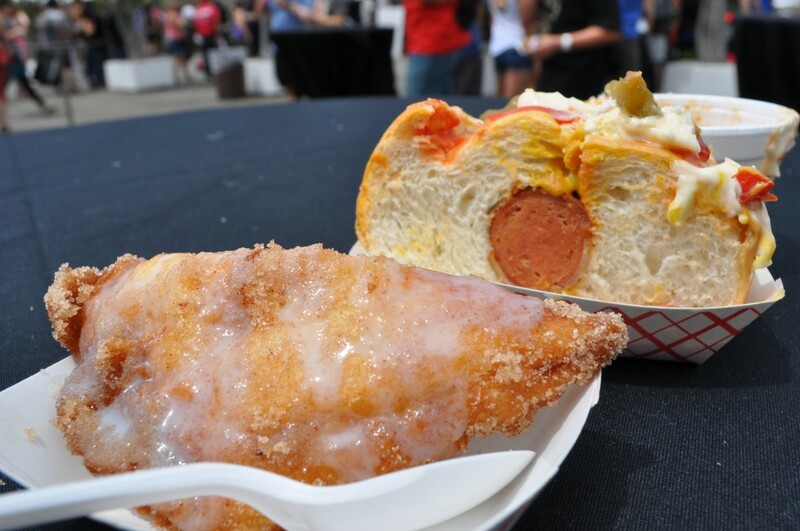 The chef of Dia de los Puercos offered a bacon wrapped hot dog, topped with traditional toppings as well as sour cream and grilled veggies, mexi-corn with bacon crumbs, chile and cheese, as well a PB & J empanada stuffed with bacon sprinkled with cinnamon and sugar after being dropped in the fryer. After leaving the Dia de los Puercos truck with a plate full of food and a full belly, you definitely needed a break or cold brew to wash it all down before moving on to the next vendor! 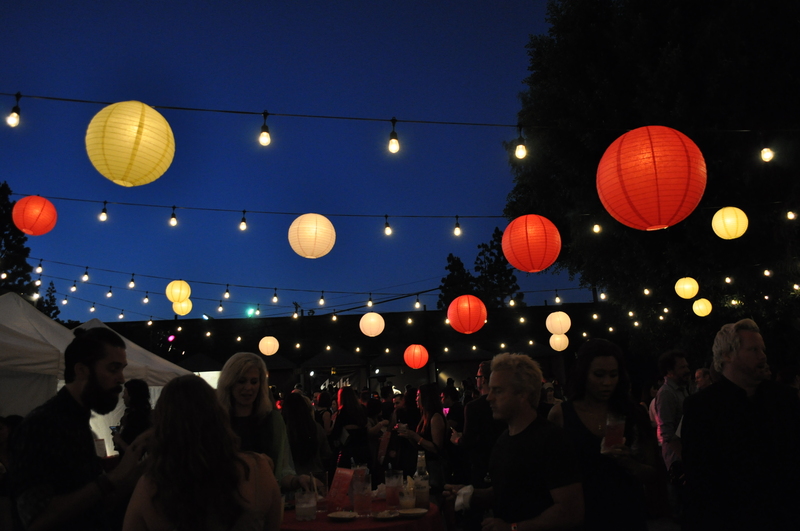 The Inaugural Big Bite Bacon Fest at the Queen Mary was an absolute success that left all attendees smilig and satisfied. 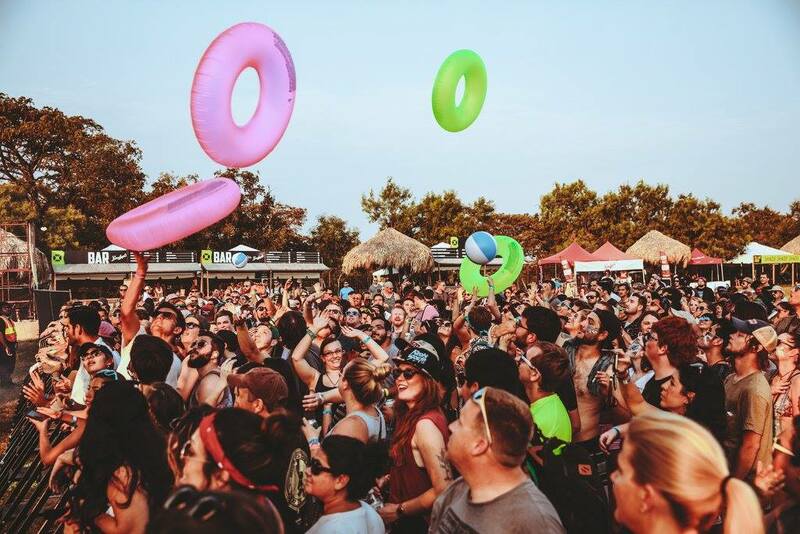 We are excited to see what bigger and bacon-ier things Big Bite Events have to offer next year.